If you’re looking for comfort food, this is it. It’s kind of a pizza casserole, because it’s so thick you need a knife and fork to eat it. 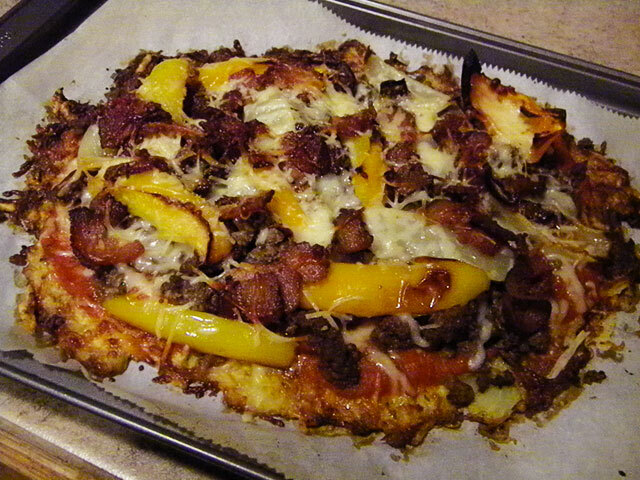 Ground meat, peppers, onion, cheese and bacon is the perfect comfort-food combination. If you haven’t tried making a cauliflower pizza crust yet, I highly recommend it. I like it way better than my almond flour crusts. Wrap drained cauliflower in a clean dishtowel and squeeze out as much water as possible, while at the same time mashing up the cauliflower. You should have the consistency of mashed potatoes when you are done. Here is a link to my Marinara Sauce. Lately I have been using Pomi tomatoes instead of fresh, which is a huge time saver.